How to use the XML to JSON Conversion Tool at fyicenter.com? 1. 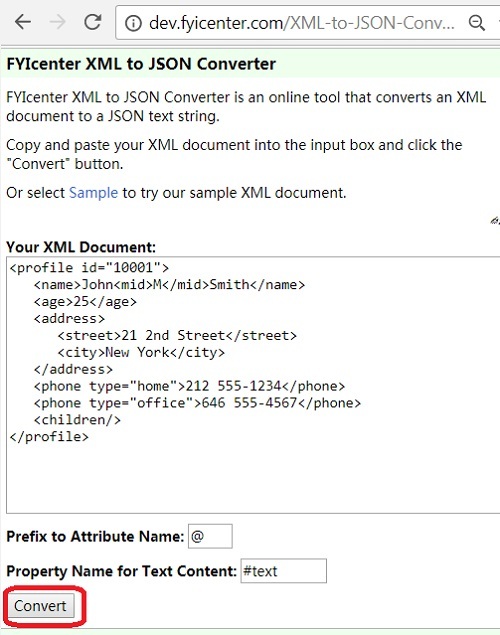 Go to the FYIcenter XML to JSON Converter page at fyicenter.com. An XML attribute is converted into a JSON property, using the attribute name prefixed with "@" as the property name. Repeating XML elements are converted into a JSON Array. "#text" is used to name XML text content, if needed. Scattered text contents are aggregated to a single JSON Array. Empty XML elements is converted to JSON Null.